This is some old parts of the story of Big Bird. Most of what is below is from around 2002-2003 time frame. The memories are all still pretty vivid. I might fill in some more blanks later. Wasn't this (UPRD's ,Rhys Millens ,XS , Universal ,etc) car ? What is this cars history ? It was one of the first R33's to come to the US. It was in SCC back in Jan 1999. It has since appeared in tons , and tons of places. It is , has been the most widely used R33 Skyline GT-R in the US. It was orginally white. It has been featured in Sport Compact Car - twice - Pikes Peak - and as the HKS car , Max Power , Road and Track , Turbo Magazine. It has been featured in ads for everyone from Speedoptions.com to Racing Hart , to XS Engineering. It has even been featured in an ad for an Australian importation company-doing a burnout. The car raced at Pikes Peak in 1999 in the Showroom stock class. It was driven by Rhys Millen to a record for 1999 of 12:13.47 . 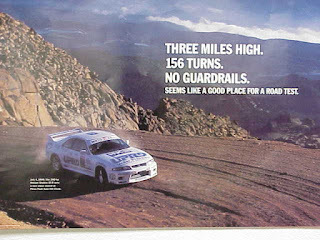 Considering a Skyline is not a rally car - not a bad time. It was raced at One Lap of America 1999 . but some gremlins kept the car from finishing. That is the reason it was on the trailer in these pictures. We took the car to the audition for Fast and Furious. They liked the car. They wanted to use it in a bigger role ,but we could not get them enough cars in time for them . That is why the car only has a small role in the movie. Lots of people wanted to see it out racing , but without several cars - the movie doesn't want to take the chance of something happening to the only car they had. Some of these cars might look familar from the original Fast and Furious. After we got the car back , we weren't quite sure what to do with it. Raced it one time at Carlsbad Dragstrip. One bar of boost , pump gas , and it turned a 12.1 @ 110 mph first pass. Trying to turn the boost up made for some messed up passes in the 12's with lots of wheelspin. We hooked up with Holley /SoCal Speed Shop /NOS - and they installed a direct port nitrous system. Very mean looking under the hood. We loaned it to a company for CES. They told us that it stopped running..... this car had been used a lot... Get the car back . Check it out - no compression. We figure - Adjustable boost , direct port nitrous , and people unfamilar with a car like this..and they had problems. We sit on the car for a while . Car goes to XS Engineering. They pull the head - all the exhaust valves are bent. Nice marks in the top of each piston. No wonder it had no compression. Started to work on a 2.8 liter , big motor for Big Bird and drag racing. Time passes and it sits..
November -December 2001 . IDRC finals in Palmdale are coming up. Lets get Big Bird running again. Get another stock motor for it. Have to retap a manifold as the stock orginal is being converted to single throttle body. Drop in a stock motor - 2530's we have off the car orginally. Get it running , get it to XS - Friday night before the event. Install the Power FC Pro , #8 plugs, temporary bottle heater. First pull on the dyno 370 hp to the wheels. We are only on wastegate spring pressure as we didnt have time to hook up the boost controller. Eric pulls some timing out of the top - pulls 360 to the wheels . Ready for the nitrous. First pulls are way rich. Jet the fuel down to 14. Bottle pressure up to 1100psi. 24 nitrous 14 fuel. Bottle pressure up to 1200 psi by accident.... 551 hp to the wheels. 100% stock internal motor. But the car is inconsistant. We decide not to use the nitrous. First pass at IDRC... 12.74 @ 108. We only got to make one pass that day. Next plans are to pull some weight out of it. Change the heavy 18x10's with the Toyo T1S 255/40/18's to some 17's and sticky tires. Put a ported head - 256 intake cam - 274 exhaust cam. Metal headgasket , head studs . More boost , and SoCal/NOS is going to help us with setting up the nitrous system better - equalizing the lengths of the lines.. This weekend (February 23rd-24th,2002)at the IDRC race (www.importdrag.com) in Palmdale took out Big Bird. 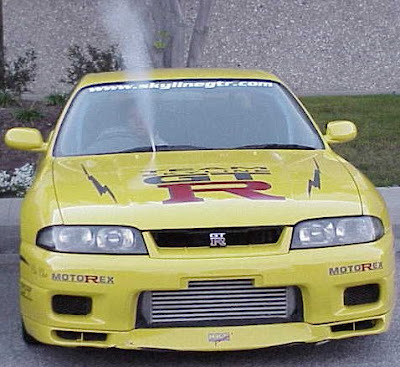 The yellow R33 from The Fast and Furious - and also the 1999 Pikes Peak Showroom stock record holder. It has a stock motor , stock headgasket , stock cams , stock exhaust manifolds , HKS intercooler, HKS EVC EZ ,HKS 2530 turbos , Power FC ,Direct Port nitrous , BFG Drag Radials (275/50/17) , Nismo twin plate clutch , stock transmission , VP C16 , 550 cc injectors , Nismo intankfuel pump , Bosch pump for the nitrous. First pass was a disappointing 13.0 @ 107 with about 0.85 - 1.00 bar ofboost. Next pass it bogged and ran a 13.4 @ 109 and the boost was up to around 1.4 at the end. The car was popping , starting hard , and having issues. The altitude was horrible . Barometric pressure was really low. Have to race again for our Team Challlenge.... can barely force the car into gear... clutch doesnt seem to be disengageing .. turn the boost controller off... but nitrous on... 12.1 @ 116..... and the clutch doesn't slip... the car feels better.... can get it and shift it alright now.Turned the boost up.... 11.80 @ 117... 60 foot getting better - car feeling better. 1.79 60 foot.. clutch not slipping anymore. Last team race of the day, turned the boost up a little. 1.60 60foot. 11.55@ 122. Boost was up to about 1.9 bar though the traps.... had to put the beat down on this 13 second Subaru after his teammate turned the flashers on when it beat our slowest GT-R.
Sunday morning, didn't qualify for street tires class.The 11.55 didn't count for qualifying. Have to run an 11.8 or better to make the 8 car field. New nitrous bottle, boost up, 1.67 60 foot,10.814 @ 132.616 my first 10 second pass. The car feels great. Qualify # 3... the #2 car ran a 10.813. First round was against a Supra... 12 second car... turn the boost down... dont need to run too much boost... 1.65 60 foot 10.96@129 mph beat him by 1.88 seconds.... and that was the fastest Supra there on street tires..
Do you still have hi res photos of P.Walker in Motorex? Saw one before he is inside a BNR32. It wasn't my picture. A friend- James had taken it when we were at Universal. It would have been on film. I read in an interview with D. McCarthy that Paul aka Brian was supposed to be the owner of the black GTR32 on Furious 7. Too bad they didn't emphasize on it in the movie. Well maybe because it was long and have story changes after Paul passed. "I thought Paul's car should really have some meaning. My first thought was that he should have a white GT-R, but the right-hand-drive didn't work." And no Paul's real life Supra is almost stock! It didn't have 1k hp. lol. Where did you get those info? He has owned several GT-Rs, and all of them were modified. One of them was tracked and even featured on car magazines. I believe Sean here even met Paul on the first Fast & Furious movie. Paul was checking out a GTR BNR32 with Sean that time. ;) He loved cars one of them the supra too.